Include the Greenery, Market, and Corner Store; students, faculty, and staff can use their meal plans at these locations to purchase hot foods, meals to go and groceries. Dining Services locations are operated in partnership with ARAMARK Dining Services. Dining Services is the hub of the sustainable food purchasing initiative. 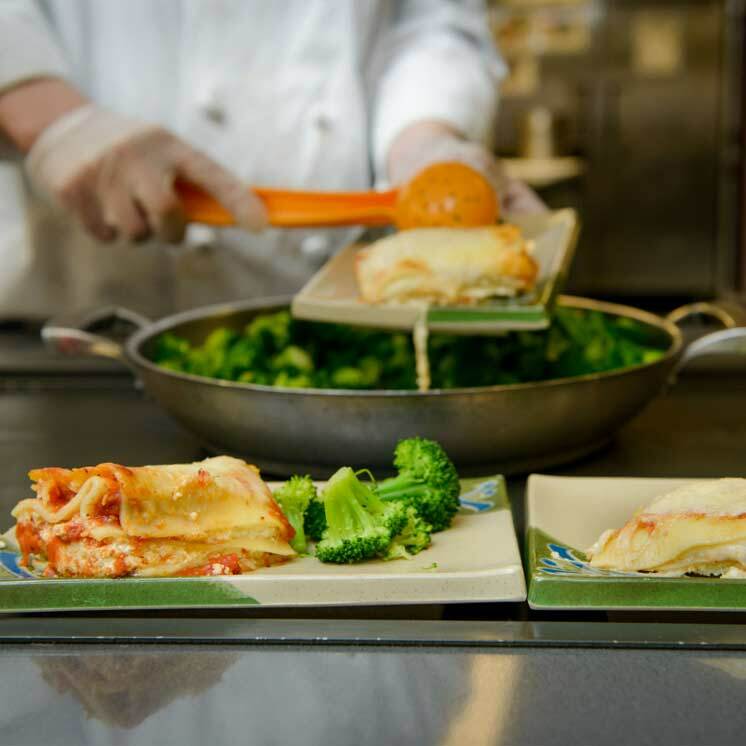 Learn more about Dining's sustainability efforts. The main campus cafeteria regularly features produce fresh from the on-campus Organic Farm and other local farms. Keep an eye out for labels marking local and organic foods in the Greenery – found primarily on the salad bar but also featured at other stations. The Greenery also features milk supplied by Smith Brothers Farm, a local dairy where the cows are never treated with hormones, and delivered by a local milk delivery business and eggs that are Certified Humane and supplied by Stiebrs Farms in Yelm. Eating in the Greenery promotes reduction of both food waste and packaging waste by giving the eater the ability to take what they care to eat and use washable dishware. The Greenery also practices composting and recycling and encourages customers to take only what they care to eat and to compost their food waste after their meal. In Fall 2009, the Greenery eliminated the availability of paper to-go containers and replaced them with a Sustainable To-Go program in which eaters use and return compostable, reusable containers. The Marketplace is located on the main floor of the College Activities Building and offers locally roasted coffee from Batdorf and Bronson, local bagels from The Bagel Brothers, fresh made salads, pizzas, soups, and sandwiches along with natural beverages and other snacks. You will also find compost available in this location! Offers a wide variety of grocery items, household items, and more with organic and environmentally friendly options available for almost all products. Operated by the students of The Evergreen Organic Farm and can be found on Red Square during the growing season. There you will find the most local and organic produce available on-campus, grown and cared for by students of the Practice of Sustainable Agriculture programs. Proceeds from the farm go directly to facilitate the growing of more vegetables.